As part of a two-day trip in the Pálava Protected Landscape Area in South Moravia, you will visit the Lednice-Valtice Chateau Complex, a UNESCO World Heritage Site, as well as the popular Punkva Cave area. 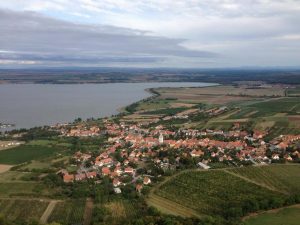 The trip includes accommodation in one of the Moravian guesthouses and wine tasting in the wine cellar. 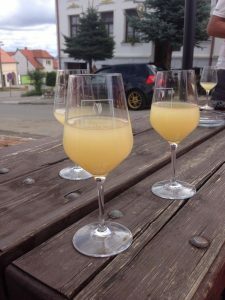 As South Moravia is famous for its wine production, this is a unique wine tasting opportunity in one of the many local wine cellars. Degustation usually includes the tasting of 5 to 10 wine samples, light refreshments (e.g. bread, cheese, olives …) as well as a lecture on the production of wine. The Pálava Landscape Protected Area (Czech: Chráněná krajinná oblast Pálava, abbreviated CHKO Pálava) is a unique area and UNESCO Biosphere Reserve located in Moravia, on the border of Austria. Its dominant features are the limestone Pálava Hills and many sustainably farmed vineyards. The Lednice–Valtice Cultural Landscape (also Lednice-Valtice Area or Lednice-Valtice Complex) is a cultural-natural landscape complex in the Lednice and Valtice areas of the South Moravian Region. The Lednice-Valtice Area is registered in the list of monuments protected as World Heritage Sites (WHS) by UNESCO. 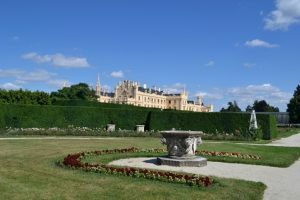 Lednice Chateau is one of the most beautiful complexes in the Czech Republic. It was built during the 13th century and today the Chateau building is designed in a very rich Neo-Gothic style. Equally impressive is the interior décor with carved cassette ceilings, original historical furniture and a remarkable, 66-foot wooden staircase in the library, that was made without the use of a single nail. The extensive Castle Park established in the 19th century is also part of the complex, containing many rare trees and structures. Valtice Chateau is located near Lednice. The Gothic 13th-century castle was rebuilt as a Baroque chateau. The Chateau consists of a three-storey four-winged building with stables, riding hall, gallery, Rococo theatre and carriage house. Enjoy incredible vistas in the naturally landscaped park. The Punkva Caves (Czech: Punkevní jeskyně) form part of a cave system, located near the town of Blansko. The Punkva River flows through the town, on which you can take a romantic cruise. The Macocha Gorge is part of the system and one of the deepest of its kind in Central Europe. It is a popular tourist attraction for casual visitors as well as for advanced technical divers.